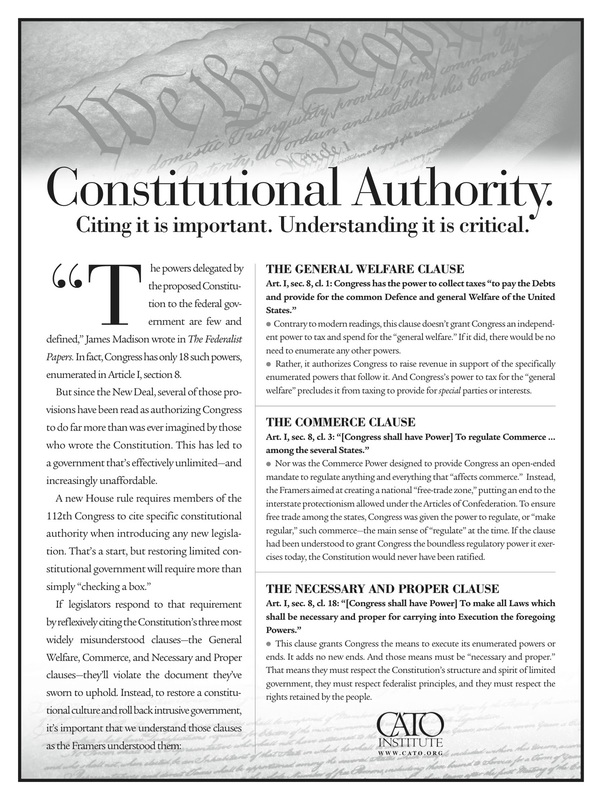 This is a nice ad that was published by Cato in several papers yesterday, and it speaks for itself. if only we could make it go viral. it is such an imp message. This should be put in the form of a clarifying Constitutional Amendment, ratified by 3/4ths of the states, then gradually repeal all laws that do not comply with the 18 numerated powers. We could repeal the 16th amendment at the same time because we would no longer need the revenue from the income tax to fund unconstitutional expenditures. Having just spent some time in DC speaking with Royalty descended from God, I mean our elected officials, I can assure you that virtually none of them believe some flimsy old document; AKA The Constitution of the United States of America, has any boundaries that keeps them from doing whatever they feel like doing. You only need to look to how much we spend to support our elected officials, maintain their edifices, friendships with other countries, and war games to know the Constitution has never been on shakier ground. This is so much spitting in the wind. Neither side believes in "rolling back"in principle other than to seeing the other's ox get gored. More importantly, this paean to orginalism is a wrongheaded in the vein of Nino Scalia and his determinedly wrong reading of history, legal and otherwise. For Pete's sake, quoting the Federalist is not citing the Constitution but one nuanced argument leading to ratification. What's more, the wisdom of the Framers, like any wisdom, was circumscribed by its times and context, else Madison's legal heirs would yet be holding slaves to this day. Orginalism is trite and shallow, and promoting it as they were the laws from Sinai( which were immediately abridged in Leviticus; so much for the original originalism! )does not serve the Cato people well. Richard, I would argue strongly that our federal government has greatly exceeded the limits that were placed on it in many ways and over many years. Without strictly enforcing limits we are going to see the power of the federal government continue to expand at the expense of individual liberty. It cannot be otherwise. ObamaCare is a great example. If the government can force us to buy health insurance, they can eventually force us to do just about anything. It's a slippery slope that has many dreadful and unforeseeable consequences. We have got to enforce stricter limits on our government. Scott-I could not agree more. Richard every argument is nuanced--otherwise it wouldn't be much of an argument. Everyone that has predicted that we are at the brink has been horribly wrong yet we all recognize that there are only two outcomes to unbridled borrowing and spending. Those outcomes are either default or inflation--there is simply no other route. We have pegged the rate of overnight monet at 0.00%, we have monetized our debt yet we (and I mean both parties) propose to proceed with running a deficit that exceeds all others. The debt is not 11 trillion dollars-it is 20 trillion and counting. How can anyone suggest, with a straight face, that the Fed at some point will raise rates when every 100bps costs 110B? We are truly like the frog in the ever warming pot of water thinking "this is quite nice---why would I ever want to change this?" The answer is that if we don't it will be changed for us. Don't think for a second that our enemies (and hopefully you are not naive enough to think that we don't have real enemies) don't realize what has always been true. if you can't afford to protect yourself, you are done. And if you can't pay your debt--you can't afford to protect yourself. I submit to you that virtually none of our elected representatives recognize any limit on their power and this ultimately spells disaster. Just on the basis of the first article mentioned this ad is either dishonest or the writers do not know how to read English. It says that "Rather, it authorizes Congress to raise revenue in support of the specifically enumerated powers that follow it." But not all the following powers require raising revenue, some are for the purpose aiding the raising of revenue, as in the power to coin money, or to establish an uniform Rule of Naturalization; some do require revenue such as establishing Post Offices and Post Roads. 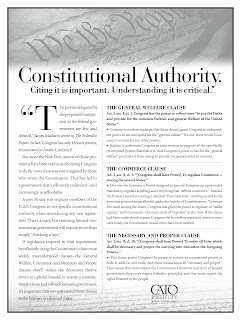 The following clauses enumerating powers are NOT dependent clauses on the raising of revenue, but dependent on the words "Congress shall have Power To"
The ad is clearly in the service of a particular ideology not in the search for the truth or reality behind the Constitution. The brilliance of the Constitution, written in a time when the society was an agrarian society in which the members would not have been able to imagine many, even most, of the conditions of modern life, is that the document they wrote can still be the basic governing document of a much larger and more complex Nation. The framers understood that they could not imagine the future and so they provided for amendment, and did not overdefine, rather than freeze the document in some sort of "original intent" petrified state. That is why the Constitution can be read as authorizing much more than the framers imagined. They wrote it that way. Fortunately they were wiser than many who pretend to understand "original intent."